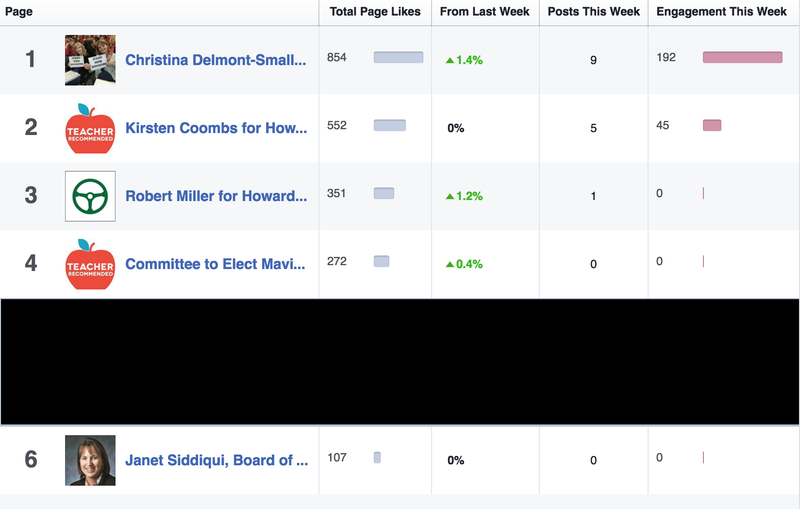 I have not evaluated the details of the online outreach for the candidates running Howard County Board of Education in 2016. I thought this would be a bit of useful information for the public and maybe even for the candidates. Most followers – Christina Delmont-Small and Vicky Cutroneo have a decent advantage with the most Facebook followers. Best recent growth (over the past week) – Christina Delmont-Small and Vicky Cutroneo have added the most new followers over the past week (somewhere around 11 or 12 new followers). Most active – Christina Delmont-Small and Vicky Cutroneo have had nine posts in the past week. There have only been six total posts from the other four Facebook pages (and five of those posts came from Kirsten Coombs). Top Engagement – Christina Delmont-Small and Vicky Cutroneo had over 190 likes, shares or comments over the past week on Facebook. Mavis Ellis has not posted anything this week – actually she has not posted anything since March 9th. Janet Siddiqui has not posted anything this week – actually she has not posted anything since January 18th. The big winners on this evaluation are Christina Delmont-Small and Vicky Cutroneo with Kirsten Coombs coming in an easy second place.